PS I don't see this being an over pressure situation. What I didn't dive into is this; what if you knew nothing of this vapor cloud or fuel sitting on the valves, what are we trying to address here? Would it just be the hard warm starts? That's why I hinted at looking close at the ignition system. From a starting/driveability focus, what does it not do that it should and when does this happen? EDIT: hindsight says the color difference from fresh fuel to valve TB q-tip is ah, normal. Every time the engine is turned off that atomized fuel dries out and turns brown. Add to this is the PCV oils being dumped into the intake. All that said it will be darker and frankly it seems pretty normal. And thanks for NOT posting a q-tip sample from your ear or any other orifice for that matter. Although I'm sure I would have LMAO! Last edited by FinalImpact; 04-12-2019 at 10:29 AM. The R throttle bodies held easily for 5 minutes. I cycled them with 9 volts, it was easier to solder up a 9v tester than to pull a 12v battery. I used isopropyl alcohol and then water for the spray test. I'll upload a video of the spray test tonight, pattern was reasonable. This all started with hard COLD starts, which could be circumvented by cracking the throttle open slightly. I remember this hard-start being worse last month than this month. Hot starts have always seemed fine. Additionally, the engine sometimes develops a misfire at warm idle (never on throttle and i cant remember if it does on warm-up high-idle), I want to say this has happened when below 1/2 tank of fuel, but that could be causation vs correlation. The oil was changed about 1k miles ago and smells a bit fouled, but i haven't worked on I-4 bikes for a couple of years so i cant remember. The miss when warm does sound like it could be a coil issue; can you think of any tests i can run with my meter? I can check and trim plug wires and disassemble the boots, but I'd prefer not to throw coils at it without more evidence. I'll check fuel pressures on Saturday, sync things up, and get a plug read; i'll report back with pics of findings. I'm not sure if the fuel accumulation is even abnormal; hopefully someone looks down their intakes after a run and can verify that. I just thinks its a bit strange. Thank you so much for your attention to my concerns. You've been incredibly helpful, and at the least someone googling this data may find the thread helpful in the future. New plugs although new, can be defective. I'd start with new plugs. Verify the killer/rocker switch is not oxidized as power comes through it. Many that use it to kill the engine vs using key find it fails. Next is with the caps disassembled, affix sand paper or something abrasive to the end and clean the depth of cap and rinse with dielectric cleaner. I found that when measure the caps all parts measure OK until assembled. Then the ceramic resistor failed to make contact in the botton of the cap. Assembled you should get 10K ohm +/- a few.... after that make sure the cap threads firmly to the wire and doesn't free spin. You can ohm the coils for reference but I wouldn't expect you to find something. Be sure to subtract lead resistance as it can fictitious ohms that the coil(s) don't actually have. That's about it if the ECM connection has been cleaned and deemed good. A rep point for being thorough! What would be the possibility of the ECM keeping the injectors energized AFTER turn off, then FUEL dripping INTO the intake until the fuel rail empties??? Perhaps running the engine, then turn off (air box off) and watch for fluid (fuel or ? ) drip/gather into that area. It's getting there some how. Thanks for the tips and suggestions F/I and Townsends! I'll check continuity on the switches and coils, and rebuild the boots. The plugs are NGK CR9EIX's and were replaced after the miss was noticed on the original CR9E's. Gapped to Yamaha spec and installed appropriately. On the stock plugs i did not notice any corrosion/debris/staining on either the ceramic end nor the business end, and the burn pattern looked reasonable for 10% ethanol fuel (light tan with a hint of gray). The original plugs compared well with each other, however #4 was just a hair on the leaner side. That could easily be a sync issue which i'll check tonight. AFAIK the bike has never been synced since new. During the plug R&R the plug wires were handled gently and i checked for spinning caps and cracked insulators, but i'll take another pass a fine tooth comb. I'll also check for signs of arcing to ground around the high-voltage side of the system. Thats an interesting hypothesis and i thought of that as well. 3) The injectors are not spraying the fuel properly into the throttle body. Last night i was installing some go-fast parts on another project bike when a thought crossed my mind- On diesel trucks (my other hobby), a poor man's turbo upgrade is achieved by disconnecting the MAP sensor. This tricks the PCM into thinking the intake manifold is at full boost, and fuels accordingly. Theres a ton of black smoke, but the turbo lights off faster. Just gotta ignore the check engine light and the toasty EGT's All this to say, i'm going to check my MAP sensor tonight. The FZ6 wiring diagram shows the reference signal to the ecm to be Pink/White which i'll check. The only bust to the fueling theory is that the bike runs well, does not smoke, and the exhaust doesent smell rich. 4) Fuel pressure. Static, KOER, and leakdown. If the ignition and injection were hot the bike would keep running so, not it. Honestly if 5 of us warm them up and look, I think this is pretty common on any ICE engine. Recap: we have port full of atomized fuel/air, you trap it under heat and walla, it condenses back to a solid. Then we have the open intake valve(s) that may or may not have fully exhausted the last combustion cycle and that crap goes back up the intake adding to the dark film in the intake. Anywho there are plenty of these that don't start at the drop of hat. Mine has never been one and it has had some fueling and ignition changes, none of which impacted its start up. Many engines that never see RPM build up carbon on the backside of the intake so I am 99% certain what you are seeing is the norm and your hard start issue is something else. F/I i'm on board with your synopsis. Combine physics, thermodynamics, and a batch-fired fuel injection system and i would have a hard time explaining why fuel WOULDNT be present in the intake after shut-down. Hopefully some others verify this in time. Quick question, could you describe a healthy idle on these bikes to me? This one has a slight flutter to it, almost like a soft intermittent popping. Not enough to move the tach, just a very soft and subtle fluctuation that i would presume untrained ears would not notice. Is your idle rock solid? We'll start with the fuel pressure results; i'm over spec with 41 psi running. Apparently when i checked the FPR with my bicycle pump, the gauge on that pump was off by ~10psi . I checked that gauge by inflating my tire to a known pressure with an expensive tire gauge (that i trust) and reading the tire pressure with the pump's gauge and then the fuel pressure gauge. The fuel pressure gauge was on the money, the pump was 10psi short. I noted that with the bike shut off the line held pressure at 30psi for 5 minutes when i ended the test. I actually ended the test by unplugging the fuel pumps power supply and starting the bike. The bike idled for about 20 seconds on static line pressure until the line went dry. I looked down the stacks after that; no fuel present. I dont know if this is a finding or more of a "duh". I'll have to think about what i can infer from this observation. With that being said, do you know a way i can physically manipulate the FPR? When i benched it i tried pressing the center rivet from the pump side of the regulator and couldnt get it to budge. I could get air past it, but apparently at ~40 psi. My next hope is to soak it in penetrating oil and give it some short blasts with high pressure. Perhaps even cold motor oil or grease to get some hydraulic action working on it. Do you think 40 PSI is something to worry about? Next was syncing the TB's. Untouched, the TBs showed ~10mmHg variance. I tightened the spread to around 2mmHg using the #1's vacuum as the baseline. #1 registered on the Carbtune at ~19 cmHg, and the book calls for 21.8cmHg. I *could* have adjusted it up to that, but i dont even know if the Carbtune's gauge is accurate in that respect. I was more concerned with balance than magnitude. Thoughts? Pic is after synchronizing. Finally was the plug check. On all 4 plugs i noticed a black sludge around the ends of the threads. It did not wipe off easily and smelled a bit like oil. I'm not sure if this is a product of top-end cleaner soaking and a lot of idling, but i have trouble thinking all 4 sets of piston rings and/or the head cracked in 4 spots all at once. I'm not seeing any oil consumption, soot around the exhaust outlet, or smelling any burned oil (in case you havent noticed, my olfactory bulb is one of my more commonly used diagnostic tools ). These plugs have <1 tank on them (with a ton of seafoam in it), about 60 miles of actual riding, and lots of idling and no-load RPMs. All the plugs shared the same pattern, however the #4 electrode had some white solid build-up around the shaft. I have no idea what that is, it almost looks like a chemical reaction of the iridium. I dont have a leakdown tester but perhaps its time for me to buy one. Plug wires passed my inspection but i'm considering taking the coils completely out and benching them. Since the bike starts reasonably reliably, and runs through the powerband well, i'm considering giving it a hell of an Italian tune-up. I have access to a nearby motorcycle dyno so i might give it the a hot supper and check the AFR with it. Thanks again for all of your help to this point! Will be a fun activity at the least. Last edited by L3FTY; 04-14-2019 at 01:01 PM. A normal idle but with open Scorps, cold start (video'ed to show charging voltages). Man is there anything anywhere you could verify that gauge with one more source? 42psi is what the R6 runs with a return system and people who dropped this unit in confirmed start and idle issues!!! WOW - if that is the case, is there any any any crazy chance that PR got swapped? It seems unlikely given the history and I hate to say BUY an FZ6 pump just to get a PR. ** Do not soak PR in OIL** it may degrade and swell it. I would however find a method to verify your gauge. Beyond that it wouldn't surprise me that all the toxins being released by the cleaners would lead to deposits on the plugs. Flogging may or may not change that. Bottom line is if the FP is 41PSI it may be a huge factor in startup. That said a few PSI over is a small percentage given the injector duty cycle at cranking speed. HOWEVER - this is a small engine and we have seen under pressure cause no start. In short this fits your symptoms of cracking the throttle to start. Please verify that gauge with something calibrated. Abstract but look up certified Electronic Calibration places in your area. You don't need a cert just a warm fuzzy that your gauge is 36.5psi +/-1% or roughly +/-0.4psi at that value. Maybe they'll test for free. 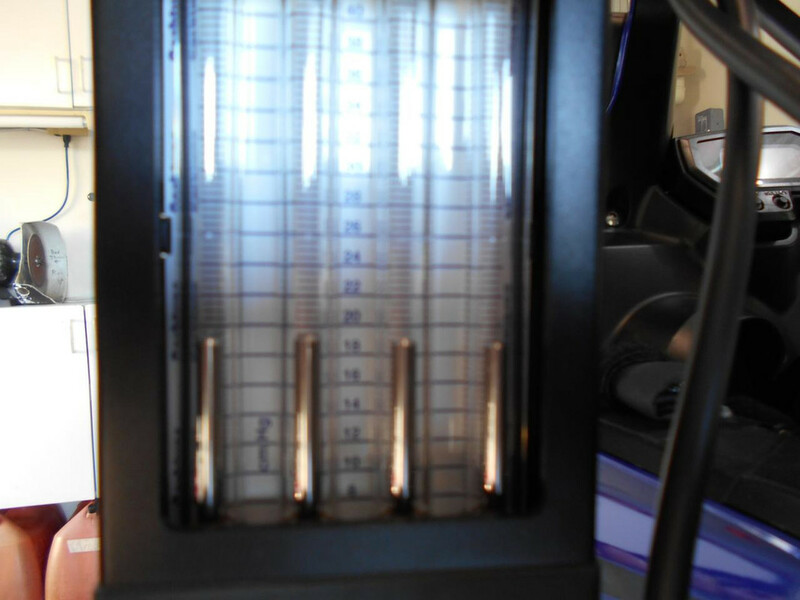 Last option would be loaner gauge from local auto parts store. Gotta go. Check back later. This is the PR that is in the pump. AFAIK its been there since the factory put it there. I'll ask my dad and sister if they know anything about this pump that i dont. I would feel quite betrayed if they had work done on this bike without consulting me first Also, i dont know if these part numbers are worth anything. Last edited by L3FTY; 04-14-2019 at 04:30 PM.